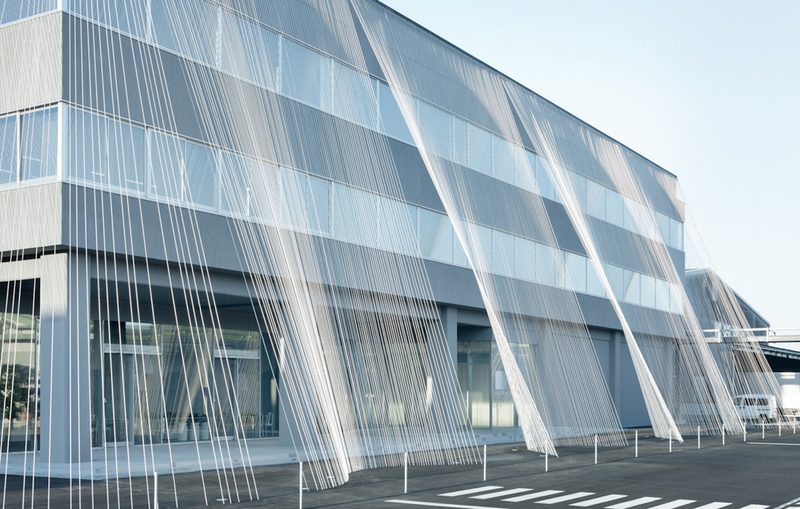 Formerly a nondescript boxy building, the 2,874-square-meter Komatsu Seiren Fabric laboratory fa-bo now draws the eye with its turfed roof and sculptural facade. The carbon-fiber strands, created by the client company, are made up of a thermoplastic carbon fiber composite called CABKOMA Strand Rod that’s considered the lightest seismic reinforcement in the world. 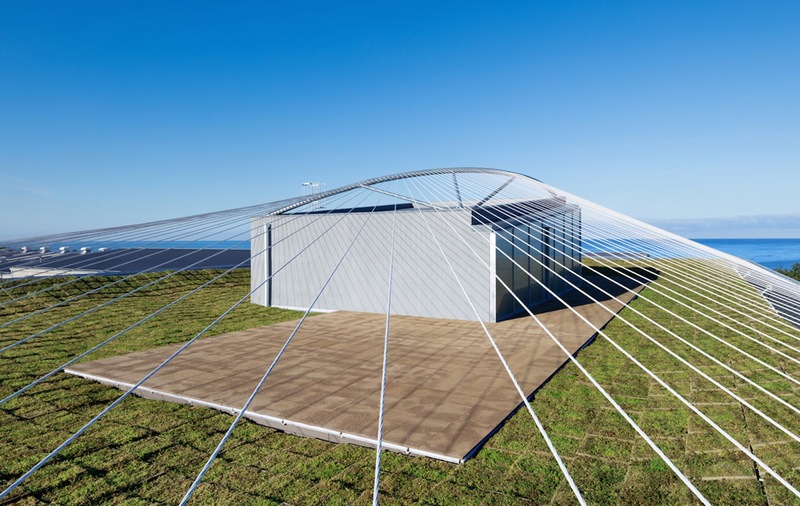 The material’s high tensile strength and flexibility makes the rods “ten times stronger than iron,” write the architects. “This is the very first time that this material was used as a means of reinforcement against earthquakes.” Gaps left between the strands demarcate building entrances. The lightweight carbon fiber composites can also be found in the interior, which feature white draped fabrics that mimic the sculptural facade. The green roof is topped with another Komatsu Seiren product called Greenbiz, porous and spongy ceramic panels made from waste material in carbon fiber production. The cables are an afterthought that are not part of the rest of the design, looks like two different buildings. Also please refer to Nepal earthquake emergency shelter from early 2015, the cables form this project were taken from the Nepal shelter 2015, which works much better as it is an inherent part fo the design, not a polite gimmick.